“THERE’S A PLETHORA OF PRODUCT CHOICE IN THE PARTITIONING MARKET TODAY AND STANDARDS NOW NEED UPDATING TO REFLECT THE COMPLEXITY”, says Kye Edwards, Business Development Director of new Partitioning brand OCULA™ SYSTEMS. 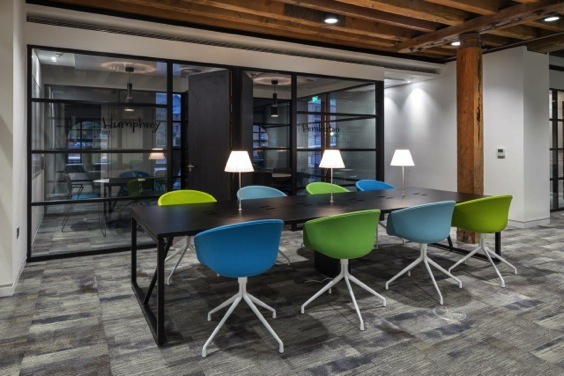 Our commercial working spaces seem to be continually changing and there has been many work place studies carried out to assess the advantages and disadvantages of individual working spaces versus open planning. Not surprisingly however, the results give no clear winner, the environment simply works best when it complements and enhances an organisations specific needs and requirements. The market supplying partitioning and doors in this environment has reacted well to the changing demands required for a more flexible and transient environment over the years and there’s now a plethora of product choice. It’s this amount of choice that has enabled specifiers to truly personalise a working environment to suit both how a specific organisation works and the building it resides in. But finding the right product is no longer the main problem. Specifying partitioning can be complex in projects today where there are problems to solve on acoustics and fire protection. It certainly doesn’t help that as the industry has flourished bringing lots of product choice to market, the Standards have been left behind and need to be closer aligned to these new product developments. For example we all test our products to technical acoustic Standards and try to simplify the results for our clients but it’s generally acknowledged that the test results are not always reflective of how the product is to be used at present and more detail and clarity is required within the Standards to reflect the product complexity. The Standards need to be more prescriptive in what should be tested to represent what is physically installed on site, such as the number of joints or modules and whether the doors are tested in a screen or independently. The Standards should not be open to interpretation and that’s why at Ocula, we are working with the FIS (Finishes & Interiors Sector Association) along with other members, to agree an effective and consistent measure. The result needs to be standardised and presented in a way that gives us all a ‘level playing field’, one that all suppliers and installers buy into and one that can be explained and not misrepresented to clients. We are hopeful this will influence future Standards and reduce confusion for buyers and specifiers in this market. A client needs to feel confident that the product design is not only aesthetically pleasing and to brief, but will acoustically perform. So whether they require single or doubled glazed partitions to help provide the right level of acoustic separation, timber framed systems that reflect a high end opulent warmth, bespoke printed glass for privacy or fire rated glass for escape routes there’s a product out there, available and the performance consistently measured and presented. There’s a great choice of products now available that have been designed for easy installation and complete personalisation of an area. One of the most recent trends follows the industrial theme of Crittall style glazing with a dramatic banded design and there’s also more choice in door opening systems, like acoustic sliding doors, that offer a better use of space within a room. There’s amazing LED lighting features, even switchable glass that gives privacy as it becomes opaque at the touch of a button. And thought as is always is given to making all these systems easily relocatable and modular in design to assist in a transient work place.